Advanced thermal debonding solutions based on ERS’ patented AirCool® technology. The ERS ADM330 System is designed for fully automated separation of wafer and carrier related to the eWLB technology („debonding“). Automated debonding for thermal release bonding agents is performed. After that, a proprietary thermal process is applied to reduce and control warpage of the debonded, reconstituted wafer. The system provides high throughput and repeatability of results with respect to the quality of the debonded wafer. The integrated laser scribing chamber in the ADM330 makes 100% monitoring of production-relevant data downstream of the debonding process possible. The ADM330 is equipped for continuous operation with optional FOUP unloading for 300mm or 330mm eWLB wafers. The system is equipped with OCR/BCR capabilities and ready for SECS/GEM interface integration. The system reads the ID on the carrier and can pass this ID number on to the factory server via the SECS/GEM interface. A recipe download from the server is then possible as is the uploading of result data to the server. 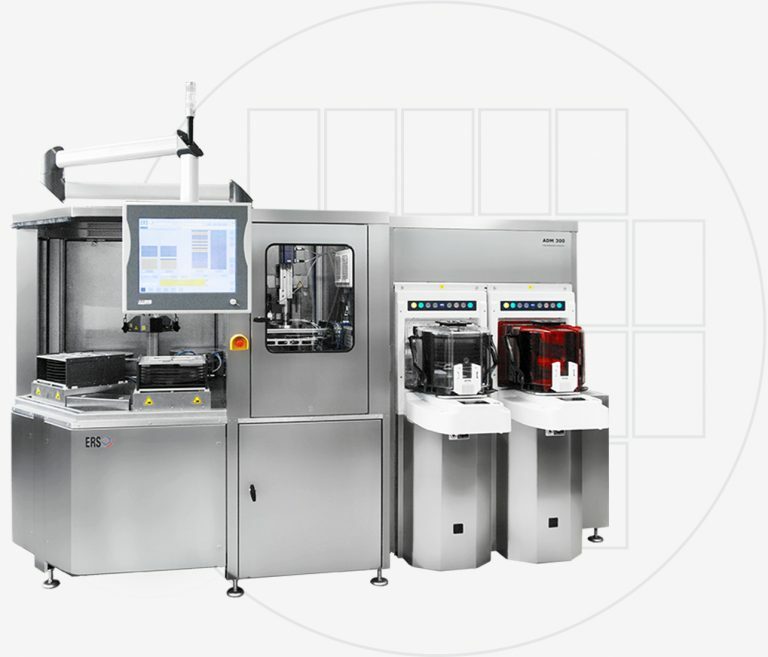 Uploading of data from the automatic debonding, automatic de-taping, automatic wafer scribing (and ID-read checking) as well as data from the highly accurate warpage inspection station is possible. Immediate carrier reuse is possible.